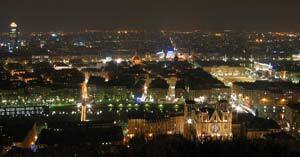 At one o’clock in the North of our b&b, Lyon is the closest regional capital. The architectural beauty of the city doubtless deserves a visit during your stay. The most ancient vestige of Roman urbanization and evidence of Lyon’s power in the Gallo-Roman period is Fourvière Hill, with its Roman theater, the Temple of Cybele and the Odeum. Lyon is, in fact, the only city in France with a permanent archeological dig. A symbol of Lyon’s devotion in the 19th century: the Basilica of Fourvière. Going from what Michelet called the "praying hill" to the "working hill" of the Croix-Rousse, we leap into the history of 19th century labor. Here we find high-ceilinged buildings adapted to the weaving looms of the Canuts silk workers. During the same period, the city spread to the other side of the Rhone and built up the left bank area with its sumptuous Haussmanian buildings. Development continued incessantly to the east, especially with the coming of industry, which has left scars to this day (vast empty lots in the 7th and 8th districts) but which also spawned interesting worker neighborhoods (quarters such as Mermoz and the Etats-Unis by Tony Garnier, the Cité Jardin in Gerland). Crossing the other river, the Saône, we come to the prestigious Renaissance legacy whose Florentine inspiration and colors dominate Vieux-Lyon (Saint Jean, Saint Georges and Saint Paul quarters). Between the two rivers, the Presqu’île peninsula is a concentration of all periods, from the vestiges of the very religious Middle Ages (Saint Martin d’Ainay Abbey, Saint Nizier Church) to the typically 19th century avenues (now known as Rue de la République and Rue Edouard Herriot), and by way of a few Renaissance streets and the monumental constructions of the classical era (Hôtel Dieu, City Hall, Museum of fine Arts ), Not forgetting, of course, the new contemporary monuments which symbolize Lyon’s development. The physiognomy of the various quarters continues to evolve as the architectural history of Lyon moves into the 21st century: Jean Nouvel and Yann Kersalé designed an audacious renovation of the Opera House; Renzo Piano built a Cité Internationale of warm red brick between the cool blue of the Rhone and the bright green of the Tête d’Or Park; out of Santiago Calatrava’s imagination came a railway station in the form of a butterfly at Lyon Saint-Exupéry airport, while the new Lycée international by Jourda and Perraudin winds through Gerland, like a giant glass snake.